The night before the G-20 summit was restless. The name of the protest march "Welcome to Hell" has obtained a literal meaning. 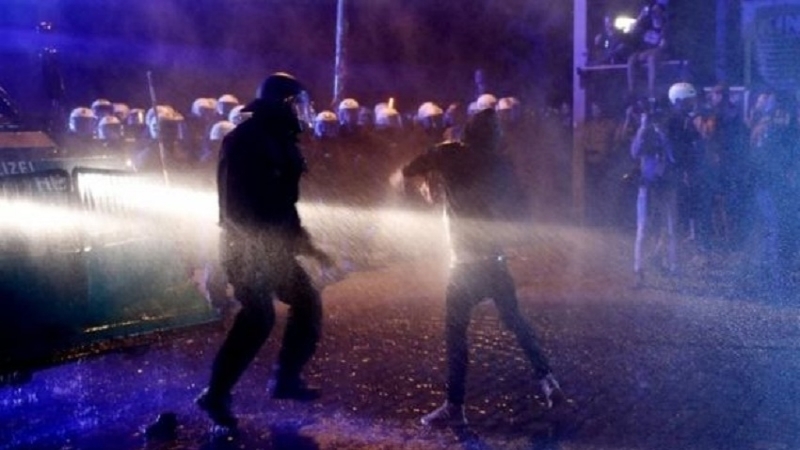 Seventy-six policemen were injured as a result of clashes with protesters in the German city of Hamburg, where the G-20 summit will soon begin, the BBC informed. On Thursday at 23.00 local time,a wave of protest struck the venue of the summit again. 12,000 people took part in the protest march "Welcome to Hell". The police of Hamburg had to resort to more active actions, The Telegraph reports. Law enforcement officers had to use water cannons and pepper spray. After long negotiations and requests from the police to disperse, the demonstrators began throwing smoke bombs and stones at law enforcers. In response, water cannons were used. According to the representatives of the law enforcement agencies, the aggression of the protesters in the march "Welcome to Hell" began after they were asked to remove the masks. The police note that three officers were taken to the hospital. Injuries among the demonstrators were reported as well. The protesters built temporary barricades, burned vehicles, damaged several establishments and repeatedly tried to dazzle the pilot with a police helicopter, the local police say. The rest of the night, order in the city was guarded by 20,000 policemen. On Friday and Saturday, up to 100,000 protesters are expected in Hamburg.